that beckons me to look through to these infinite possibilities. Black then white are all I see, in my infancy. Red and yellow then came to be, reaching out to me, let’s me see. In the Alchemical Opus, there are 4 generally recognized steps in creating the Philosopher’s Stone. The first is known as the negrido, the black stage, in which the prima materia is calcified and dissolved. The second is known as the libido, the white stage, in which the material is cleansed of all impurities. The third and fourth stages are the cintrinitas, the yellow stage, and the rubedo, the red stage, in which the work is brought to fruition and the Stone is created. The infancy of the Stone is represented by the black and white stages, and the Stone is said to grow to maturity in the yellow and red stages. 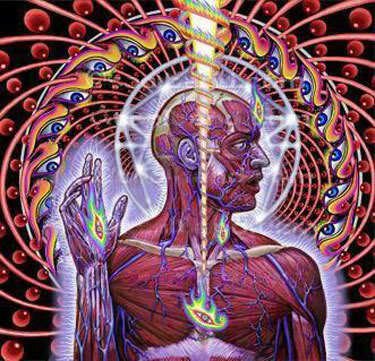 This is a direct reference to the Emerald Tablet, the universally recognized primary text of Alchemy, in which Hermes Trismigestus states: “That which is above is like that which is below, and that which is below is from that which is above, working the miracles of one thing.” I find it interesting that Maynard starts from below and works up. This may have some connection to the Hermetic concept of the body summoning the spirit, as much as the spirit creates the body. Let’s examine the Golden Spiral very quickly. a logarithmic spiral which is sometimes known as the golden spiral. 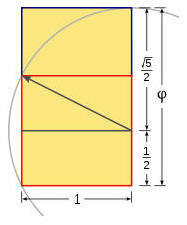 The Golden Spiral is unique in geometry, in that wherever the Spiral is divided, the part thus separated will be identical in form and appearance to the original Spiral. This means that each part is identical to the whole, which concept underlies the philosophy of the macrocosm/microcosm. It speaks to the unity of all things, and of God with His creation. It geometrically demonstrates the Hermetic notion of the original division of (for lack of a better term) God. 21 / 13 = 1.6153846…. 34 / 21 = 1.6190476…. 55 / 34 = 1.61764705…. The fountain that he’s referring to is found strewn throughout numerous Alchemical texts (see, for instance, the Parabola of Madathanus or Treviso’s Allegory of the Fountain). Sometimes called the fountain of youth, it could also be called the fountain of reincrudation. This is the bath of the Alchemical King, in which he is dissolved, purified and cleansed, and from which the Stone eventually emerges.